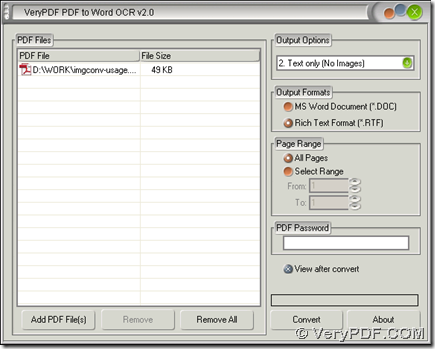 This article would like to introduce you a method to convert PDF to TXT in Windows platforms. If you want to know more, you can keep reading this article. First, you need to double click installer of PDF to Word OCR Converter on your computer, then follow setup wizard step by step so that PDF to Word OCR Converter can be installed on your computer successfully. Then, you will notice the path of PDF can be shown in processing table, which means it is successful to add PDF file for this process from scanned PDF to TXT. Third, if you only want to convert text of PDF file to TXT file, please click “2. 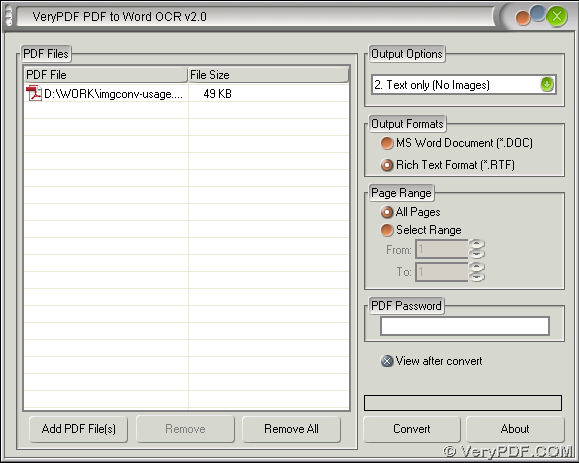 Text only (No Images)” on dropdown list of “Output Options” of interface in order to make PDF to Word OCR Converter only extract text of PDF to Word file later. Then, you need to set targeting file type: you can click one of radios of “MS Word Document” and “Rich Text Format” on interface of PDF to Word OCR Converter, then after conversion, your Word file can be DOC file or RTF file. Finally, to get a targeting folder for Word file, please click “Convert” button on interface, then there can be a dialog box popped out, where you need to select a folder and click “Save”, then PDF to Word OCR Converter can help you convert PDF file to TXT file very quickly. The above is the method to convert PDF to TXT only with PDF to Word OCR Converter, if you have some questions on this process, you can drop your comment here. In addition, if you would like to know more information of PDF to Word OCR Converter, you can go to homepage of PDF to Word OCR Converter. Have you improved column alignment in PDF to Text Converter software? This entry was posted in PDF to Word Converter and tagged pdf to txt. Bookmark the permalink.